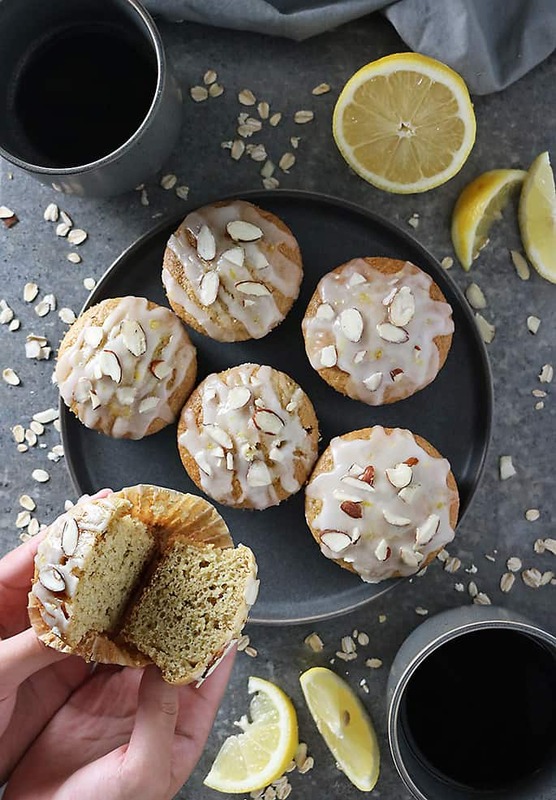 Intoxicatingly lemony, these “luscious” Gluten Free Lemon Muffins also happen to be butter free and would make a delicious, healthyISH, afternoon snack or breakfast! Today I am joining Madison (over at A Joyfully Mad Kitchen) and several other food bloggers for Muffin Week! Though I gotta admit, I struggle with muffins. Cookies and Curries, I can wing them and end up with something edible. But, with muffins, there’s no telling what the end will be. Sometimes they come out of the oven looking so flat and woebegone but end up tasting delicious. Once, I expected to pull out muffins from the oven and out came rolls! They tasted pretty good, but the texture and look was way, way off. Yet some other times, they come out of the oven with a beautiful dome and end up tasting downright disgusting. Once, they tasted so bad, even my dogs refused to eat them. True story. When Madison asked me to join in on Muffin Week, I was excited about sharing some gluten free pistachio white chocolate muffins. I was going to grind up pistachios and use that pistachio flour to make muffins, along with a hint of cardamom and white chocolate pieces. In my mind, those muffins were gonna be spectacular. But, y’all, my mind didn’t mirror reality. I was adamant about not going to bed with bad muffin mojo, so I decided to clear my kitchen counters and start fresh. I had a bunch of lemons in my fridge, and, as my daughter simply adores lemon muffins, I figured I’d try one more time before throwing in my apron. This time around, I leaned on my blender heavily to whip up some Gluten Free Lemon Muffins. 2) I also added in the other dry ingredients such as sugar, almond flour, salt, baking powder, and baking soda, and blended them in with the oats. 3) Then, I added the wet ingredients of eggs, milk, and coconut oil and pulsed this together with the dry ingredients. 4) I finally added in some lemon juice and lemon zest and blended it all up before spooning this mixture into muffins cups and baking up some gluten free lemon muffins. 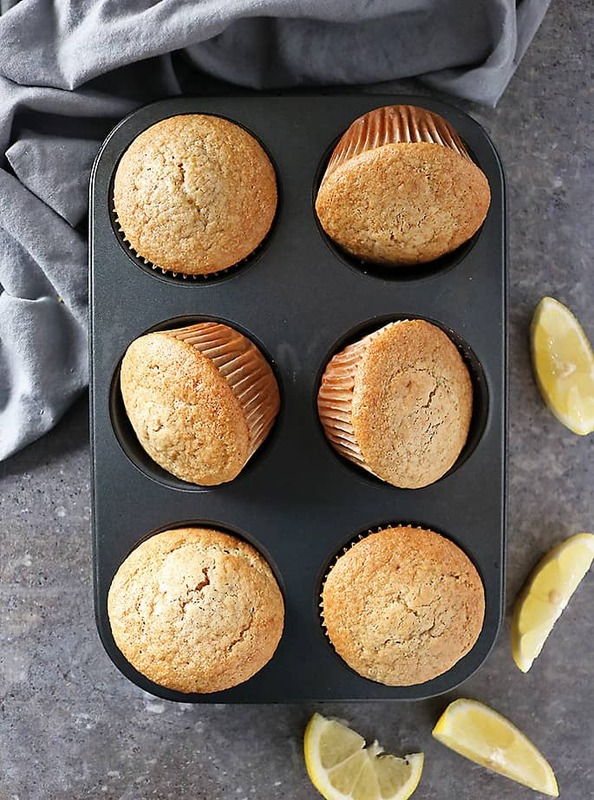 5) When the muffins were at room temperature, I made a glaze with powdered sugar (using my blender again to blend up real sugar and a smidge of arrowroot powder into powdered sugar) and some lemon zest and juice. BTW, if you’ve ever run out of powdered sugar and don’t want to make another trip to the store, then why not blend up your own- right? While I used a smidge of arrowroot powder in mine, you can also use cornstarch, if you have it handy. Just blend up the granulated sugar and arrowroot powder/cornstarch and boom! You have just the right amount of powdered sugar. Also, wait a bit to open the lid on your blender as otherwise powdered sugar dust will be everywhere! 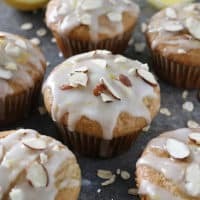 My daughter described these lemon muffins as simply luscious and ended up eating two just as these pictures were done. 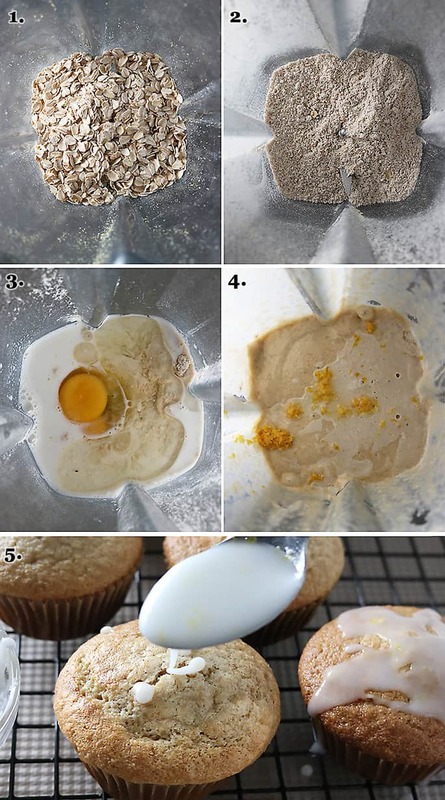 If you are looking for a tasty, “luscious” gluten free lemon muffin, I sure hope you give this recipe a try. 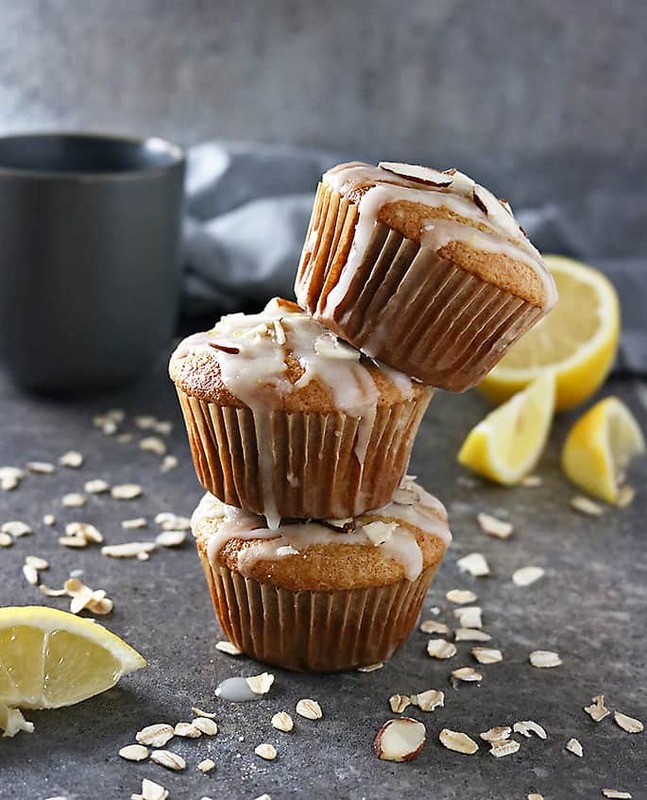 If you happen to fancy these Lemon Muffins, let me know what you think by leaving a comment and rating below. If you make this recipe, please post a pic on INSTAGRAM -tagging @savoryspin so I can see! For more recipes and ramblings, like us on FACEBOOK and follow along on PINTEREST! Add the oats to a blender and pulse until oats are ground into a fine powder. Add sugar, baking powder, baking soda, salt and almond flour to the ground up oats and blend a few seconds so all the dry ingredients are well incorporated. Add the coconut oil to a bowl and microwave it for 10 seconds or until it's melted but not hot. Add it to the dry ingredients in the blender. Also add in the egg and milk and blend well. Then, add in the lemon juice and lemon and blend a few seconds until everything is well incorporated. Line a 6 muffin tray with muffin cups and spoon Lemon Muffin mixture into these cups and bake 18-20 minutes. Then, remove from the oven and let cool a bit before glazing. *If you glaze while warm, that glaze will run everywhere. Add the granulated sugar and arrowroot powder (or can use cornstarch) to a blender and blend on high speed for about 20 seconds. Add powdered sugar to a bowl and mix in the lemon juice and lemon zest. 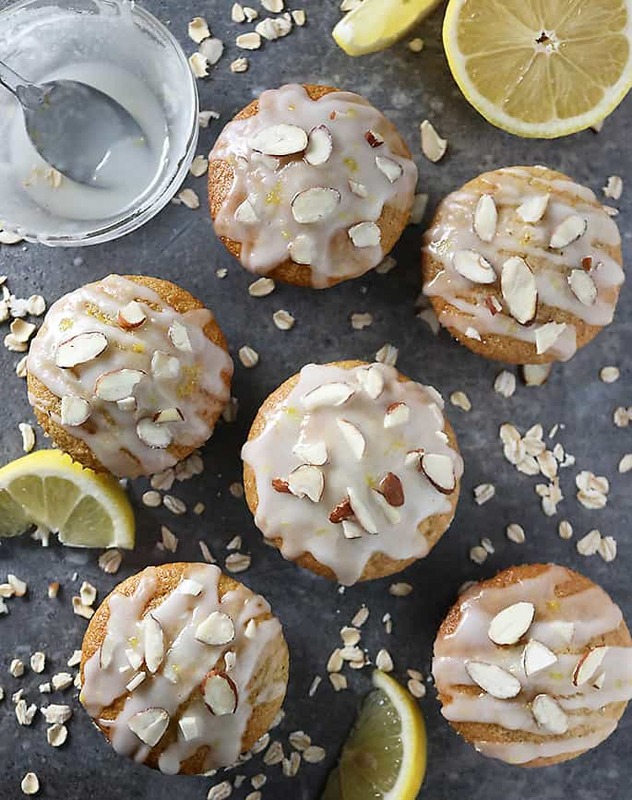 Drizzle glaze over Lemon Muffins, (optional) sprinkle on some slivered almonds and enjoy. *Nutritional info is per very well fit. Please make sure to check for yourself the accuracy of quantities and nutrition listed. Please head on over to Joyfully Mad Kitchen to check out what other marvelous muffin recipes my fabulous fellow food bloggers have shared! Thanks for stopping by y’all, here’s hoping your weekend is wonderfully delicious! Gluten-free baking can be tricky but I am glad you didn’t give up 🙂 These muffins look perfect! They turned out really perfect. Love that tender smooth crumb. Gorgeous photos! I love lemon anything and so does my hubby. I’ll have to try these soon! My daughter loves lemons and GF!! We will be giving these a try they look amazing!! These look amazing and I so love a good muffin. And even better that these are gluten free. 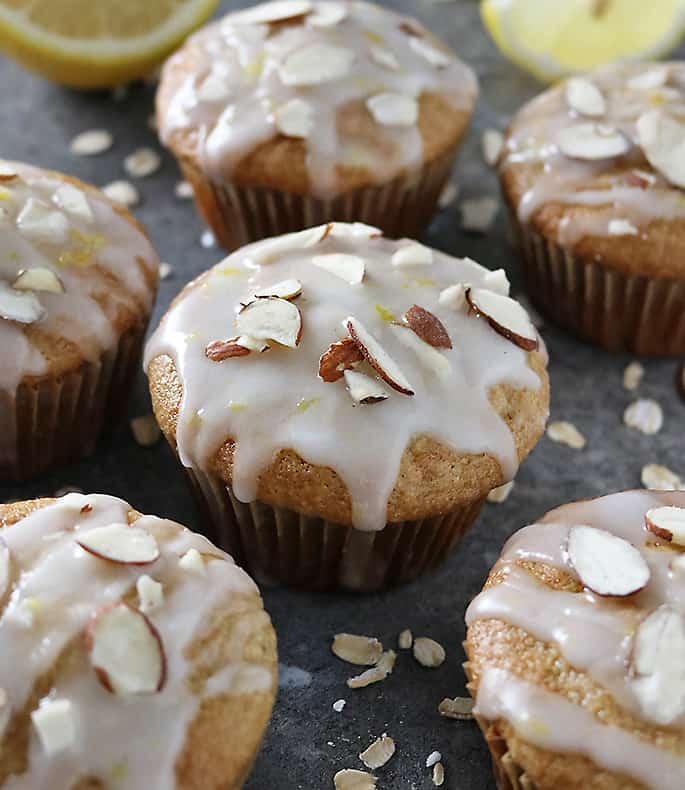 That lemony flavor sounds perfect for a muffin. Shashi! Are you out of powdered sugar now, too!? I think a trip to the baking aisle is in your near future. And you need to put one of everything in your cart. 🙂 Seriously, though, I love these muffins! I make muffins occasionally on weekend mornings, and I need to put these on the list. True story: I made blueberry muffins last week, but I totally forgot to add the sugar. Let’s just say they weren’t one of my better baking creations. Robbie just looked at them and went about his way. So sad! Maybe I’ll make these but toss in a handful of fresh blueberries this weekend! Ha ha, I was laughing when you said you once expected muffins to come out of your oven, but rolls came out. Brilliant! And then the dogs not even eating another batch? No way! Can I be one of your dogs? Lucky for us all these times you’ve had recipes that haven’t gone to plan though. 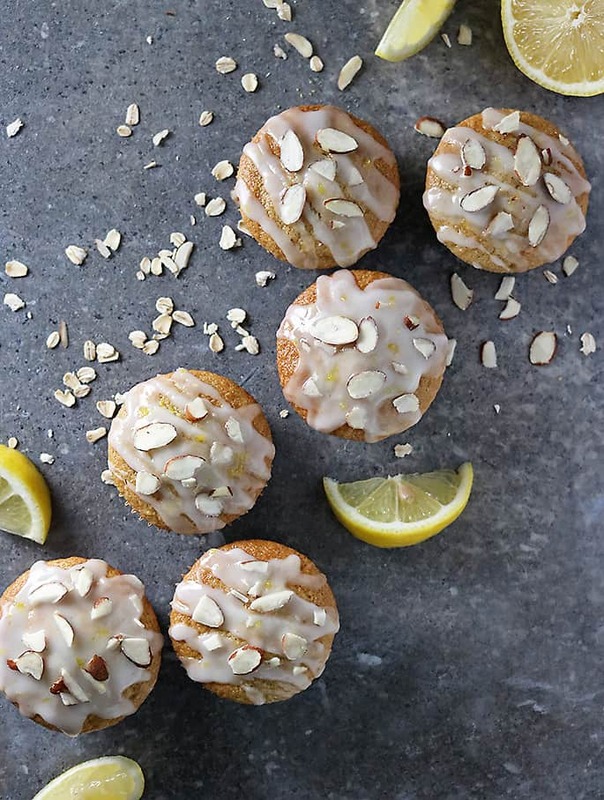 As now you’ve come up with these fabulour Lemon Muffins! Lovely recipe Shashi!